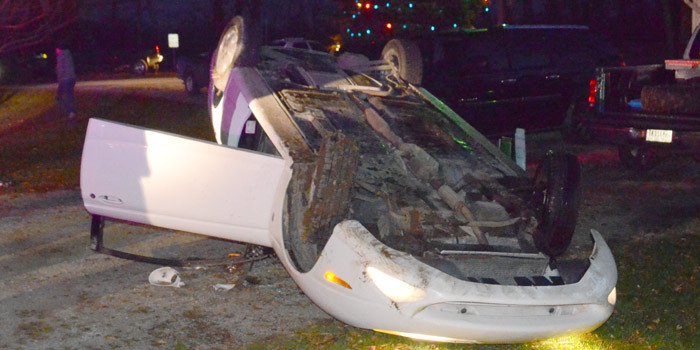 MILFORD — No major injuries occurred following a rollover accident that occurred on East CR 1300N, Milford, Friday, Dec. 4. The accident occurred at 5:32 p.m. According to police reports, Derick A. Herendeen, 46, East 1300N, Milford, was eastbound on CR 1300, driving down the center of the road. Meanwhile, another vehicle was westbound on the same road, also coming down the center. Herendeen reportedly swerved to avoid a collision and his vehicle went off the road, struck two mailboxes and flipped, landing upside-down. A witness stated that Herendeen climbed out of the vehicle, dropping his car keys next to the door. Police arrived and reported finding empty beer cans in the vehicle. An officer also reported smelling marijuana on Herendeen’s breath. Herendeen submitted to a toxicology test. Medics treated him at the scene for a laceration to his right ear, then transported him to Kosciusko Community Hospital for treatment and a blood draw. Results of the test are pending.